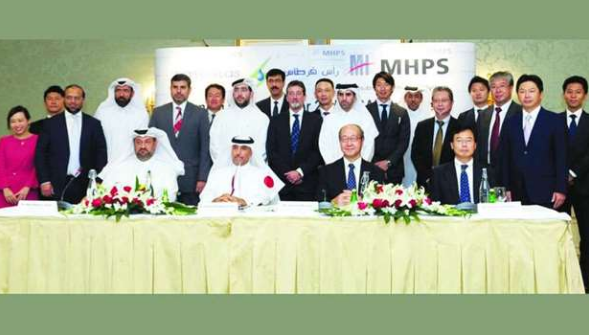 Ras Girtas Power Co signs 15-yr service pact with Mitsubishi Hitachi Power Systems | Qatar Electricity & Water Co.
Al-Hajri, Muyama and al-Reyahi among other executives during the signing of the 15-year long service agreement worth QR630mn between Ras Girtas Power Company and Mitsubishi Hitachi Power Systems here. Ras Girtas Power Company (RGPC) has signed a 15-year long service agreement with Mitsubishi Hitachi Power Systems worth QR630mn. Gulf Times – Ras Girtas Power Company chairman Mohamed Nasser al-Hajri said RGPC’s existing long-term service agreement with Mitsubishi Hitachi would end in the first quarter of 2019. Now a new 15-year long agreement has been signed with Mitsubishi Hitachi, he said, and noted the agreement established “strong and long-term relationships” between Ras Girtas Power Company and Mitsubishi Hitachi Power Systems. Mitsubishi Hitachi vice-president Akimasa Muyama stressed on the “strong relationship” between the two companies, noting that the agreement demonstrated the “shared ability to provide clean, renewable and sustainable energy, as well as innovative solutions” that benefitted large-scale projects serving local economies. Ras Girtas Power Company CEO Abdulmajeed al-Reyahi said the agreement provided “long-term maintenance services to gas devices and spare parts and maintenance for Ras Girtas power plants”. He said Ras Girtas is a 10-year-old company and has a specific agreement with Qatar General Electricity and Water Corporation (Kahramaa) for 25 years to provide electricity and water and meet the needs of the state. “Under the agreement signed today, Mitsubishi Hitachi will provide all turbine maintenance, spare parts and logistics needs in cooperation with Ras Girtas,” he said. Al-Reyahi said all logistical requirements were ensured to carry out the necessary maintenance work within Qatar. Ras Girtas is cooperating in this regard with many companies such as Nakilat and Qatar Fuel (Woqod). Al-Reyahi also said the company was not affected by the siege, because the company has a clear strategy to cover all requirements for spare parts and various equipment (required for maintenance) for a period of six months. This helped the company look at many alternatives with focus on lower prices and higher quality during the period. Ras Girtas Power Company (RGPC) is a joint venture established to increase Qatar’s water and electricity capacity and meet the eneds of the State. Located at Ras Laffan, the RGPC plant produces 2,730 megawatts of power and 63 MIGD of potable water, making it one of the largest facilities of its kind in the entire world. Ras Girtas output accounts for 30% of Qatar’s power and 17.5% of the water capacity.